© marsha gray carrington. all rights reserved. Marsha cannot remember a time in her life when she was not making something. Whether it was drawing, painting, making photographs at an early age with her Brownie camera, or just putting together found objects. Marsha has always known that visual creativity was her calling and passion. Her mother, Louise H. Carrington, an accomplished and recognized portrait and life painter, has inspired her since an early age, and continues to paint at the age of 82 at her home in Richmond, VA. For the last 15 years, Marsha's award winning greeting cards have had national as well as international presence, and her designs have appeared on wall decor, stationery items, photo albums, holiday gift wrap, and more. Marsha is also an internationally published children’s book illustrator. 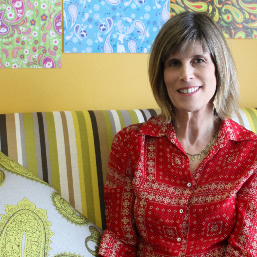 Marsha's creative passion recently took her in an exciting new direction when she began designing “Crazy for Paisley™”, introducing themed paisleys for everyday, special occasion, and holiday. The debut collection includes themes for children, teens, and adults. Marsha’s fresh approach to the time tested paisley is a sure-fire winner and a must-see at the May 2013 Surtex Show in NY, where she will debut the collection. Along with “Crazy for Paisley™”, Marsha will debut several other collections that include “Hip Hip Holiday™”, “Geo Meo Mod™”, “Go Go Garden™”, and Ambler™. Her designs are fun, fresh, and always playful. Marsha pursued the arts throughout her education. She graduated with a BFA in Painting and Graphics, as well as a concentration in Photography, from James Madison University in 1977. In 1981 Marsha graduated from California Institute of the Arts with an MFA concentrating in Fine Art Photography. While there she was inspired by a children's book written and illustrated by Chris VanAlsberg, and this was the start of her desire to illustrate children's books. That desire, although never wavering, was put aside for 13 years while she worked in Visual Effects Animation, working on films such as Braveheart, James and The Giant Peach, and Ghost, just to name a few. In the spring of 1996, after being offered a 3-year contract at Disney to work on Dinosaurs, Marsha decided it was time to make a major move. She left the film industry completely, lived on her savings for 1 year, traveled to New York City, found an agent and received her first children's manuscript to illustrate, which was her first book, Jake Johnson, The Story of A Mule. Since that time Marsha has gone on to illustrate 6 more books, including Tessa's Tip Tapping Toes, Saving The Liberty Bell, and Coriander The Contrary Hen, and now is working on her first book that she is both writing and illustrating. Along with illustrating children's books, from 1998 till 2007, Marsha co-owned the Greeting card company mjZOOM, of which she along with other artists and designers, created greeting card and stationery products that were sold nationwide and in Canada, Austyralia and the UK. In 2008 Marsha decided to stop manufacturing to concentrate on her creativity and currently designs greeting cards, stationery products, wall decor, and other products, for several large companies. She continues to pursue her fine art painting as well as photography. Although trained traditionally in photography using film and printing her own silver prints, Marsha now works mostly with a digital camera and is exploring the many possibilities there. She prefers black and white photography to color for its timeless and sensual qualities. For her, like paint, the camera is just another creative tool, to capture a moment, a feeling, or a conceptual idea. Originally from Virginia, Marsha lived in Los Angeles, CA for 30 years until April of 2009, when she and her husband Kevin O'Neill, moved to Portland, Oregon. They lived there only briefly before moving to Sandusky, OH in October of 2009 to be closer to family. Marsha has 2 stepdaughters, Kaeleen and Meagan, and a granddaughter, Ramona, all who live in Los Angeles. Marsha and Kevin, and a small brood of pets, presently live in a 121 year old Victorian in downtown Sandusky, with lots of history related to the "Underground Railroad". Marsha's studio is only blocks away and overlooks Lake Erie, where she finds inspiration daily. "Sandusky is a beautiful town rich in history and architecture, and I am eager to watch it's revitalization and be a part of it. I find no matter where you go on this planet, there are cool people and wonderful things to be found anywhere, you just need to open your eyes”. Marsha is involved in her community's Art Walk and is a board member of the Sandusky Cultural Center.